The CHS is constructed with fiberglass, as well as Glass Carbon Flatstringers, and Carbon Railstringers. This makes it very durable and strong, but slightly heavier than the XR version of the Energy. It's an extremely quick race board, with astounding high-speed potential. It's easy to stay in control and sail at high speeds on flat, or choppy water. The Energy planes early, is fast upwind, controllable on reaches, and is (relatively) easy to gybe. This board has a broad range of conditions in which it is sailable, from light wind, big sail to high wind planing conditions. 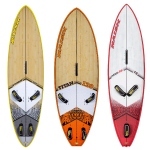 It's the ideal board for a sailor who wants one board to use in virtually all wind speeds and sailing conditions. This used board is like new A+ condition.